Help! There are Blinking Lights on My Dashboard! Keep watch for your blinking engine lights! We sympathize. Whether you are a first-time car owner or a long time driver, a blinking light on your dashboard can cause panic. The light just keeps blinking and you have done everything you know, from hitting the glass to opening your hood, to make it stop. In fact, you aren’t even sure what the blinking light means. Do you have an alien sensor installed in your car? Does an icon light up when it’s time to do your taxes? Check Engine Light. Fortunately, most of the time the check engine light says “check engine” when it’s flashing. It may also appear as a triangle with an exclamation point in it. 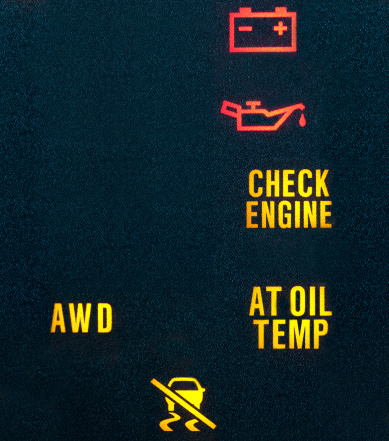 Unfortunately, this is a very serious light that notifies you when something is wrong with your engine. You’ll need to take your car to the nearest auto repair shop to diagnose the problem. ABS Light. Usually, this light says ABS when it’s lit. This light starts flashing when there is something wrong with your anti-lock brake system. Don’t be fooled if it turns off after a few seconds; get it checked as soon as possible. Tire Pressure Light. This light usually has a circle (or wheel) with an exclamation point in the middle. This means that the pressure in at least one of your tires is low. Try filling your tire up with air at a nearby gas station. If the light persists, take your car to a tire shop. Battery Warning Light. This light looks like a large battery with a + and – sign in it. This means that your battery either isn’t charging correctly, or it’s time to replace it. Take your car in to an auto shop before it doesn’t turn on. Oil Pressure Light. Usually, this light can be identified by the oil can icon with the drop coming out of it. This light signifies a significant drop in your oil pressure due to leakage or a low amount of available oil. Get your car to the nearest auto repair shop to diagnose the problem. More information about the blinking light on your dashboard can be found in your owner’s manual that came along with your car. If you have a blinking light that wasn’t listed and you aren’t sure what it is, take your car to your auto repair shop to get it looked at. Your mechanic will be able to correctly identify what the light symbolizes.